growth – Teach. Empower. Transform. Students today are faced with many decisions in their life. FLOC aims to help students understand that they constantly have many choices, even when it comes to their health and the health of their community. Part of the youth empowerment programming adopted by FLOC’s West Virginia Leaders in Action program includes the self-awareness and knowledge that they do have power to make good decisions and affect change. Here in WV, the statistics for childhood obesity rates reached close to 18.5% in 2011 placing the state high on the list at number 13 compared with the 50 other states. For the same year, DC youth obesity rates were just above 21% putting the district at 4th highest among other states. Poor health and nutrition and lack of activity can also be major determining factors in a person’s ability to focus, to sleep well, and have energy and motivation. The link between education and health is well documented, but it would not be surprising that students’ health could affect their education as well. For the second half of the fall semester, our Leaders in Action programs have been immersed in the Health and Nutrition unit. Students looked at the consequences of added sugars with the enhanced visuals of actually measuring out the numbers of teaspoons of sugar in a variety of familiar foods and products. They also discussed standard dental hygiene practices and strategies for caring for our protective tooth enamel such as avoiding sugary acidic beverages. Everyone was surprised to learn that most fruit juices and sports drinks are comparable to sodas when it comes to acidity and sugar content. The focus this month is on the importance of movement and activity in our lives. Learning or developing unhealthy habits as a child can set a person up for a lifetime of difficulties and disease. Play and movement can be fun, and implementing healthy habits can increase a child’s energy and confidence. So last week, in honor of the First Lady’s Let’s Move campaign, we visited a local county park’s indoor playground and got active for one hour. After learning how to measure their heart rates and get them up to beneficial levels, with the help of a moon bounce and some fun games like clothes pin tag, all those present got the recommended 60 minutes of activity in for that day. The health of a population is affected not just by education and awareness, but also by economic inequalities, and access to healthy food and safe, active, appropriate spaces to play, among other things. We don’t want our young people to be limited in life by preventable health issues. Their potential is at stake, so let’s move towards a more healthy and just society together. On May 13th, FLOC celebrated a milestone of 50 years of service to students in the Washington, DC community. At this year’s Beyond the Classroom luncheon, FLOC shared with board members, volunteers, new and old supporters, and community partners our vision for growth in the next 3 years; a look at the work we have accomplished and what is left to be done; and a call to help raise the vitally important funds to realize this work. Please take a minute to read Executive Director Tim Payne and FLOC student alumnae Brittany Okafor’s remarks. Also, check out the video we debuted at the luncheon showcasing our work the past 50 years and why FLOC is an organization worth celebrating. If you missed this year’s luncheon, please join FLOC at Come Dream With Us: The Future of FLOC on Wednesday, May 20 from 6-8pm at the WNDC. Details and RSVP at this link. 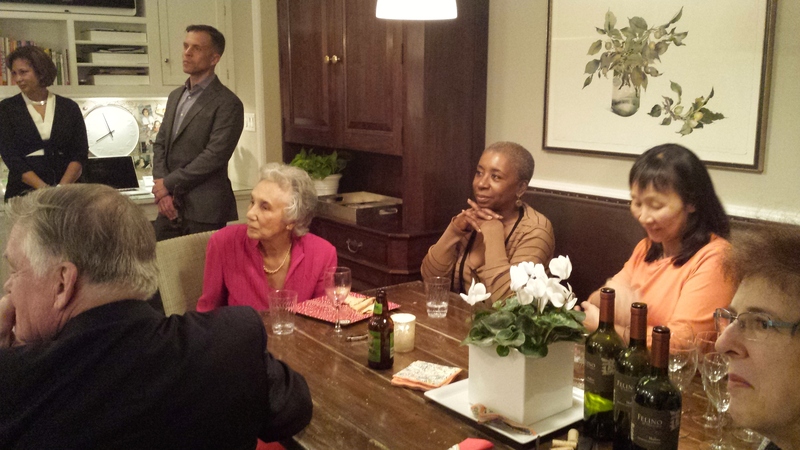 On April 16th, board member, Kate Vogt opened her home for a reunion of FLOC Board Alumni to celebrate the organization’s 50 years of service. The evening was highlighted by FLOC’s Executive Director, Tim Payne, recalling the organization’s inspirational history and laying our strategic path towards 2017. In 1965, 25,000 people marched together from Selma to Montgomery, including Rev. Gordon Cosby. On the plane ride back to DC, Rev. Cosby wondered, “What’s our Selma?” He shared his experiences with members in his congregation, and week by week more of them were moved to act. Fred Taylor was one of them, and led the charge to close an institution for wards of the state, forming For Love of Children in the process. Reflecting on that moment, FLOC’s Board and staff asked a year ago, “What is our Selma today, and where do we need to go?” And the answer was pretty clear. There are more postsecondary degrees in Washington, DC than anywhere else in the country, but precious few of those degrees are going to students who were born here. Too few students in this city are ever given those opportunities. In classrooms across DC, only two in five low income students can read on grade-level, and the numbers aren’t much better in math. Only half the students in ninth grade classrooms will ever make it through to graduation. Fewer still will go on to college. For too long, this gap has been allowed to exist, and untended it grows wider and wider. 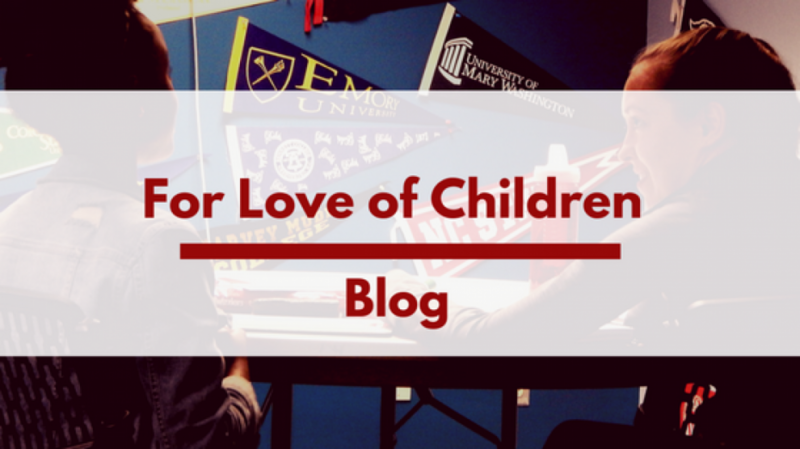 At FLOC, we still believe that every child matters. All are equally important. We see a city where every child’s potential – regardless of zip code, skin color, or family status – is realized. We’ve demonstrated that high-quality, enhanced learning programs give students the skills and knowledge that lead to postsecondary success, and so we are working to double the number of students we serve. Starting this year, we will add new tutoring programs at partner sites and introduce new cohorts of students to our proven college access program. Next year, 150 new students will receive our support. By the 2017-2018 school year, we will open a community-based center east of the river so that traditionally underserved students can access our high-quality programs close to home. This growth will continue until at least 1,200 students are served directly by FLOC. But that’s not enough. Meaningful and lasting solutions come from the concerted efforts of like-minded partners, and so we will work to align our resources and interests with other organizations to create a network of support reaching any family in need of educational services, ensuring that more students participate in high-quality programs all across this city. The ultimate goal of our work is to empower the children and families we serve. We will stand side by side with our families, joining them in their call to demand the services their children need. At FLOC, we believe we can transform our communities, transform our city, by starting one young person at a time. Those early questions asked by Rev. Cosby and FLOC’s founders 50 years ago have spurred years of tireless work to secure better outcomes for youth in this city. Today, it is in the efforts of our former board members, their commitment and leadership that have guided FLOC through the past half-century. 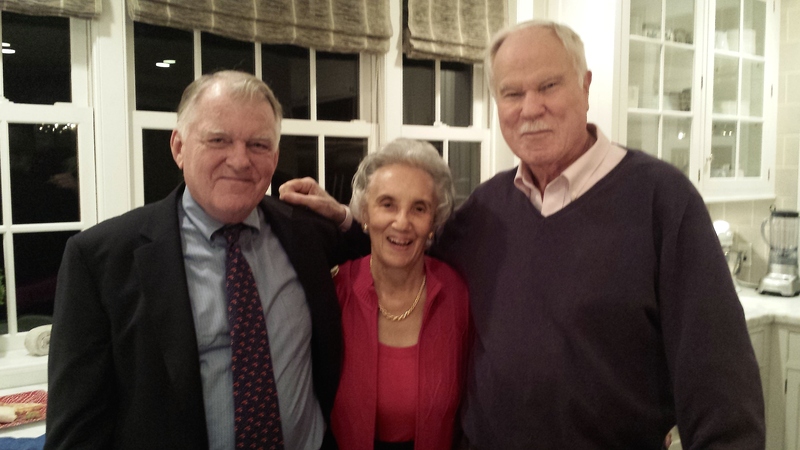 In keeping with this leadership, several of our long-standing FLOC supporters and board alumni have made a special investment in FLOC to celebrate our 50th anniversary. Two very generous anonymous donors have committed to match all donations made by board alumni this year, $1 for $1, up to $50,000. They will ensure that alumni support will now have double the impact. By December 2015, we want to announce that our board alumni have contributed more than $100,000 to sustain FLOC’s efforts into its next 50 years. FLOC is grateful for the work of its board members, past and present, and all that they have done and continue to do to strengthen the work of FLOC. FLOC is celebrating a milestone this year: fifty years of serving disenfranchised youth in Washington, DC. This is a milestone that few organizations reach and FLOC owes much of this success to those who came before us and our own community. Our students and families have always been on the forefront of what we do. 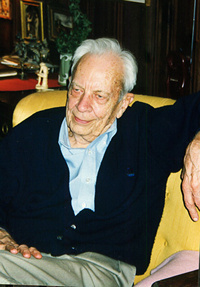 Gordon Cosby was instrumental in the founding of FLOC. When Reverend Gordon Cosby came back from the march in Selma, Alabama, in 1965, he asked his congregation the difficult question: “What will be our Selma?” In FLOC’s beginnings, they gathered support of their churches and the community to shut down Junior Village, a warehouse for 900 abandoned children. FLOC and its partners arranged viable schooling and living alternatives for these children, and shut Junior Village down in 1973. FLOC’s early leaders also founded DC’s first Child Advocacy Center and co-founded the Consortium for Child Welfare, a city-wide collaborative of 16 foster care and adoption agencies. From the mid-1970s through the 1990s, FLOC continued to embrace a variety of child and family services and served as an incubator for developing programs. One of these was Hope and a Home, a transitional housing program that helped parents create nurturing and stable homes within the caring and loving support of a community. In 2005, Hope and a Home incorporated as an independent 501(c)(3) agency. FLOC also was one of the founding members of the Healthy Families Initiative, and its program remains a strong part of Mary’s Center for Maternal and Child Care. As other nonprofit collaborations and public agencies emerged to address the community’s needs, FLOC asked those we served what they needed for the community to thrive. FLOC reevaluated its mission and decided, in 2005-2006, to focus on educational programming as the most effective way to help young people achieve a positive future. 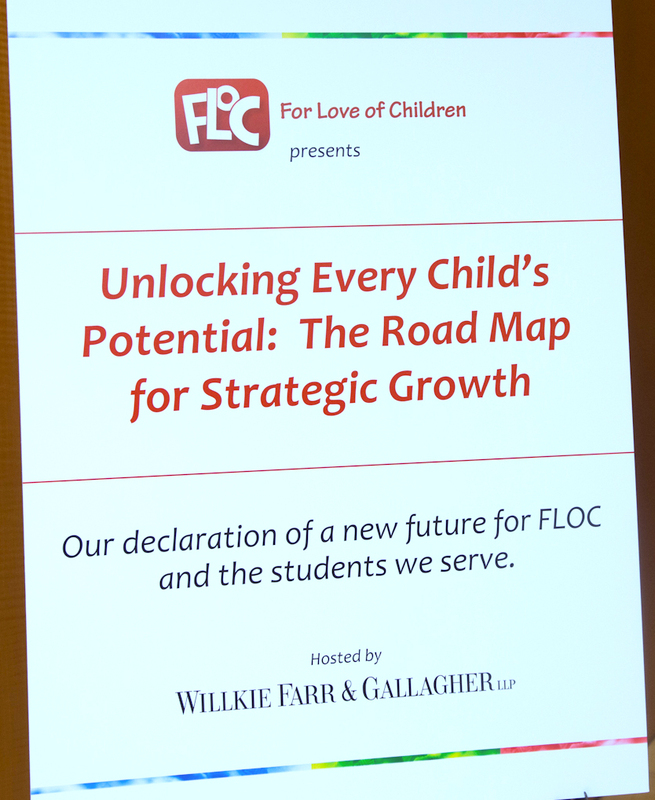 While the refocused mission is relatively young, FLOC’s educational programs have deep roots. The Neighborhood Tutoring Program was founded in 1997, the Outdoor Education Center in 1971, and the forerunner of FLOC’s Scholars Program in 1999. One of the civil rights movement’s earliest initiatives was challenging inequality in educational opportunities for African-Americans. Today, the majority of low-income children of color do not receive the quality education they deserve. One wonders what Dr. Martin Luther King Jr. would say about this. As a man of hope, he would probably speak optimistically about our youth and rebuke the idea that some children lack the capacity to learn. Every student can learn. The primary goal of FLOC is to ensure that all students — regardless of race, ethnicity, or neighborhood — receive the support they need to achieve their dreams. serve. With them, we believe we can transform this city. Starting this year, we will add new tutoring programs at partner sites and introduce new cohorts of students to our proven college access program. Next year, 150 new students will receive our support. By the 2017-2018 school year, we will open a community-based center east of the river so that traditionally underserved students can access our high-quality programs close to home. This growth will continue until at least 1,200 students are served directly by FLOC. But that’s not enough. of like-minded partners. We will work to align our resources and interests with other organizations to take collective action, to create a network of support reaching any family in need of educational services. Not only will more students participate in our programs; more students will participate in more high-quality programs all across this city. We recognize that the ultimate goal of our work is to empower the children and families we serve. We will stand side by side with our families, joining them in their call to demand the services their children need. We will work tirelessly with them to transform our community. Over the next three years, we intend to raise two and half million dollars in additional financial support. We will leverage this capital to accomplish four major goals: investing in the Fred Taylor Scholarship Fund, allowing us to financially invest in FLOC students working to secure a postsecondary degree; second, ensuring our continued vitality and health by creating a reserve fund; in addition, devoting the capacity building resources necessary to support our growth; and most importantly, funding the program expansion, partnerships, and community organizing work that will bridge the persistent opportunity gap in our city. We hope you will join FLOC in its efforts to expand, grow and serve more youth on their path to postsecondary success.